Biogas production is a green method of recycling farm waste into heat, electricity and fertilizer. Anaerobic digestion is a process in which microorganisms break down organic waste in the absence of oxygen. 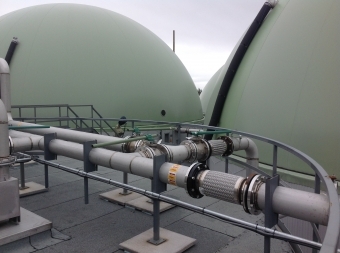 The biogas produced can then be fired in a generator and converted to electrical power and thermal energy. In previous projects, Enertec Engineering has provided detailed design reviews. Specifically, ensuring European designs are compliant with local codes. In areas of discrepancy, process and building services piping are redesigned to be compliant. Kevin VanWingerden P.Eng has sat on the CSA board for the Code for digester gas and landfill gas installations. My irrigation contamination problems despite years of ozone use have been solved by a far superior pasteurization system designed and supplied by Enertec Engineering. Enertec not only solved my problem but helped get the majority of my costs covered through efficiency incentive programs. The staff at Enertec proved to be both knowledgeable and helpful, ensuring a smooth installation and were a pleasure to deal with at every step of my project. The result is a pasteurizer system that saves me money, provides me peace of mind, and helps ensure that my irrigation water is clean. If you are looking for solutions, improved performance, or simply a well engineered system for peace of mind, I highly recommend giving Enertec a call and having chat about your challenges.